OpenFOAM v1706 includes the first release of a major new set of functionality to enable users to perform overset mesh calculations. The approach performs cell-to-cell mapping between multiple, disconnected mesh regions, to generate a composite domain applicable to both static and dynamic analyses. Any cells on the outside of the mesh (part) that require interpolation should be on this patch. Generate a 0/zoneID volScalarField indicating the mesh zone (not to be confused with cellZones). 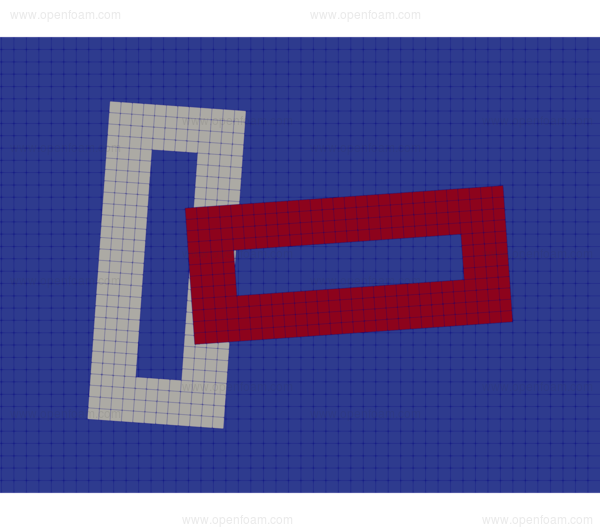 This field can usually be generated using standard OpenFOAM tools, e.g.topoSet, setFields. It should start at 0 and be consecutively numbered. There is no limit to the number of zones. In the fvSchemes dictionary (in the system directory) select the relevant overset interpolation method and which additional variables should be included. By default, all solved-for variables and some solver-specific fields use overset interpolation. If necessary adapt the wall distance calculation to a continuous method, e.g.Poisson, advectionDiffusion. The default meshWave method does not walk through the overset interpolation. Update the solver to an asymmetric variant in the fvSolution dictionary (the matrix from interpolation is asymmetric). All asymmetric solvers except from GAMG are supported. In practice a good choice is the smoothSolver with symGaussSeidel for transport equations (U, k, etc.) and PBiCGStab with DILU preconditioner for elliptic equations (p, yPsi). This output shows that there are two mesh ’zones’, i.e. described by the 0/zoneID field. Of the cells, some are identified as unreachable (hole), some are interpolated, and the majority are solved (calculated). The new IsoAdvector algorithm captures the fluid interface in multiphase calculations. It is currently avaiable in a variant of the interFoam solver, named interIsoFoam, offering an alternative to the MULES interface capturing method. IsoAdvector employs a geometric Volume-of-Fluid (VOF) method for the advection of a sharp interface between two immiscible, incompressible fluids, applicable to both structured and unstructured meshes. Tests have shown that the method generally offers more accurate interface advection and a sharper interface representation than the existing MULES method. The following videos compare the results obtained for the interIsoFoam and interFoam solvers. Note that the time spent in the advection step is significantly reduced. Depending on the case and the set-up, the sharper interface can cause both reduction or increase in overall simulation time due to its effects on the pressure-velocity system. Note: to operate the interIsoFoam and interFoam in pure advection mode (without solving the pressure, velocity, phase fraction system) the frozenFlow entry should be activated in the PIMPLE sub-dictionary of the fvSolution file, i.e. The isoAdvector method was developed by Dr. Johan Roenby, DHI, Associate Prof. Henrik Bredmose at DTU Wind Energy and Prof. Hrvoje Jasak at University of Zagreb, Department Faculty of Mechanical Engineering and Naval Architecture. The work was funded by a Sapere Aude postdoc from The Danish Council for Independent Research, Technology and Production Sciences (Grant-ID: DFF - 1337-00118B - FTP). Co-funding is also provided by the GTS grant to DHI from the Danish Agency for Science, Technology and Innovation. We also acknowledge the significant code contributors by Dr. Vuko Vukcevik and Dr. Andrew Heather. IsoAdvector is explicit in nature and therefore operates best with a Courant number less than 1. However, sub-cycling can be used to run with larger time steps. Due to the sharper interface, surface tension dominated flows may benefit from a smoothed version of the phase fraction field for improved robustness of the curvature calculation. The restart behaviour in older versions of OpenFOAM often exhibited noticeable instabilities, particularly for compressible flows, and using 2nd order time integration. This version includes many incremental updates to aid smooth restart behaviour, leading to significant improvements in restart robustness.